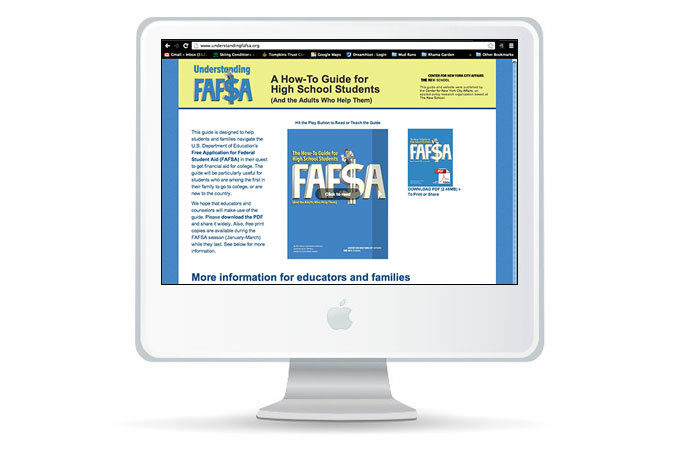 Understanding FAFSA A friendly and fun instructional guide and website for students, guidance counselors, teachers, and volunteers on how to fill out the Free Application for Federal Student Aid (better known as FAFSA), to secure financial support from government and colleges. 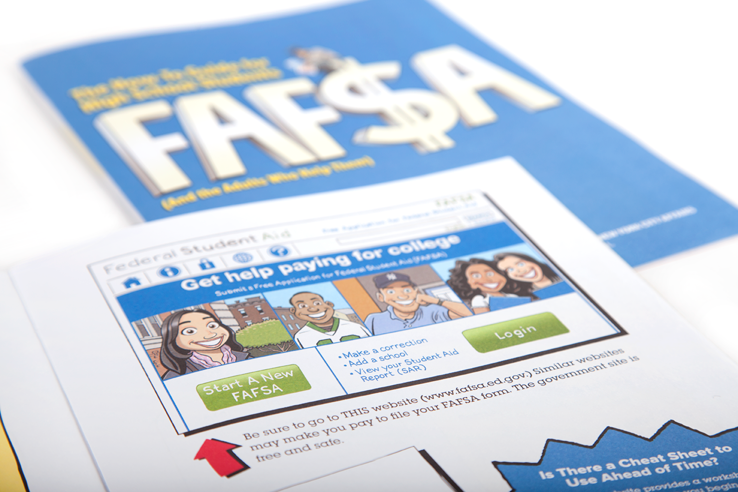 Most students must fill out the Free Application for Federal Student Aid (better known as FAFSA) to get financial support from government and colleges. 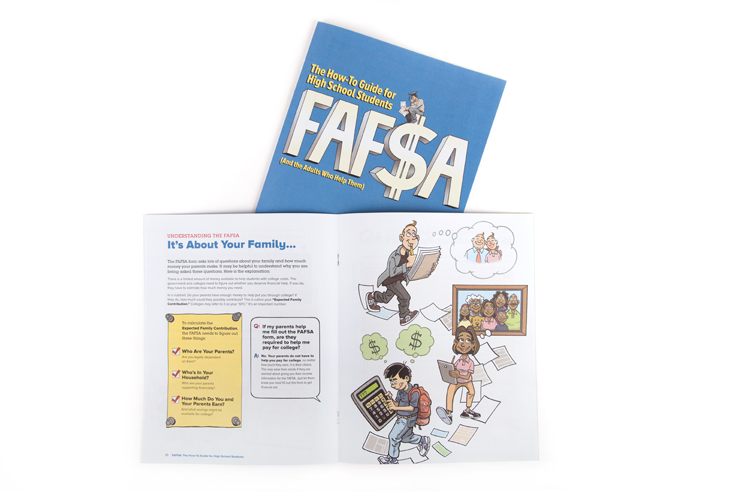 But the form can be tricky for many students—particularly those who are recent arrivals to the U.S. or live in homes different from the traditional two-parent family that FAFSA was designed for – which is the reality for many teens living in NYC. The New School’s Center for NYC Affairs’ research found that a discouraging number of students simply gave up on the form – and with it, a crucial opportunity for college matriculation and success. For the initial phase, Center for NYC Affairs (CFNYCA) envisioned a friendly and fun instructional poster that would speak to students as the primary audience, but could also easily used by guidance counselor, teachers, and volunteers in student training sessions. Phase 2 would be a web version that would be accessed in the classroom on computers or Smart Boards. 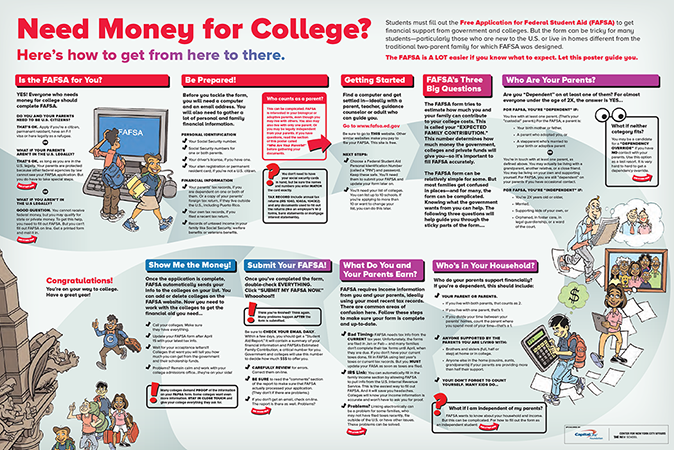 The poster would be distributed throughout the NYC high school system to every guidance counselor, guidance trainers and organizations that train FAFSA volunteers with the goal of reaching as many of the city’s 80,000 high school seniors as possible. The project team included our design team, the client – who was also the project’s copywriter and project manager – along with an accomplished editorial illustrator. Working collaboratively with an iterative process, after 2 months we had developed a beautifully designed piece with a “road map” concept – not unlike a typical game board such as seen in Life or even Candyland. 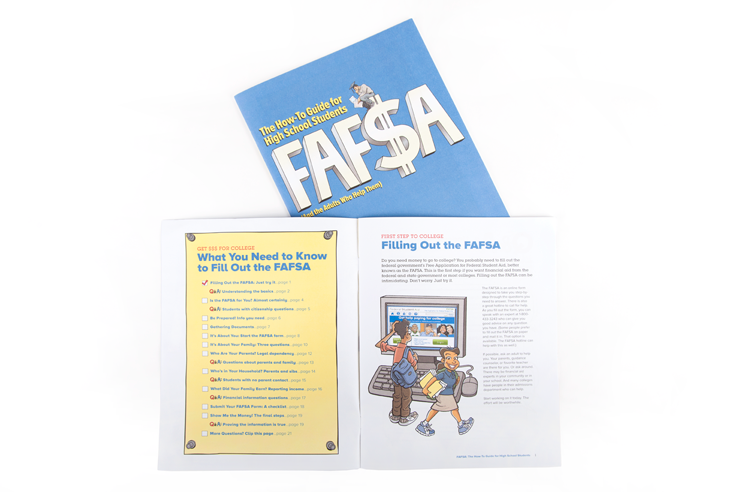 It was succinctly written to direct college-bound seniors down the path they need to take to complete the FAFSA form, finally arriving at the ivy-clad gates of a typical institution of higher education. Hurdles many students encounter were identified, providing solutions and pointing to additional resources. However, an additional challenge presented itself. 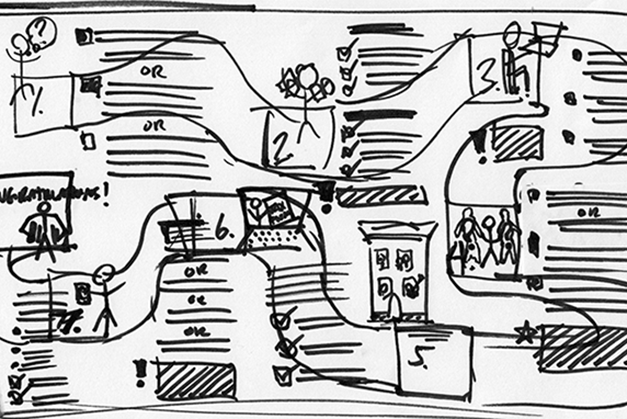 The FAFSA process was just too complex, and the poster was not the simple document we had initially envisioned. Re-thinking the best vehicle to help CFNYC meet its goals for the project, we re-purposed the information, artwork, and design, ultimately creating a 24-page manual instead – which was available as a free PDF downloadfrom the new companion website we designed and developed soon thereafter, at www.understandingfafsa.org. 20,000 copies of the manual were sent directly to all NYC Department of Education high school principals, guidance counselors and college counselors – first in an initial printing, then in a second after demand exceeded inventory, and then finally in a third print run. The project was a huge success. 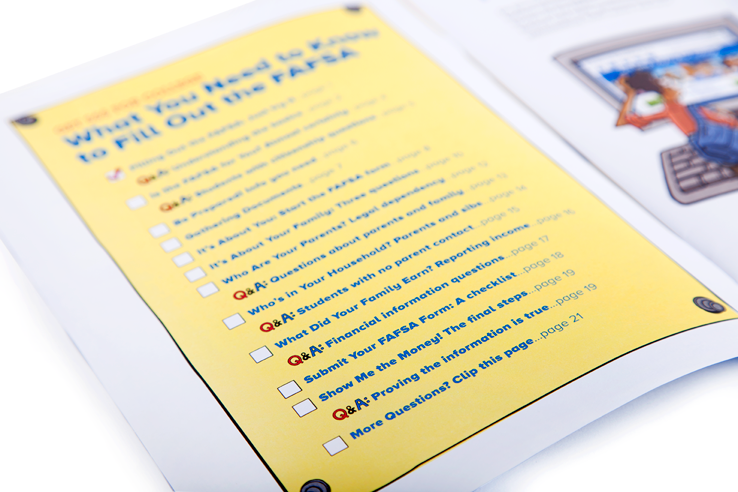 It was obvious to both the client and funders that a guide to navigating the FAFSA application process was a much-needed, in-demand resource.